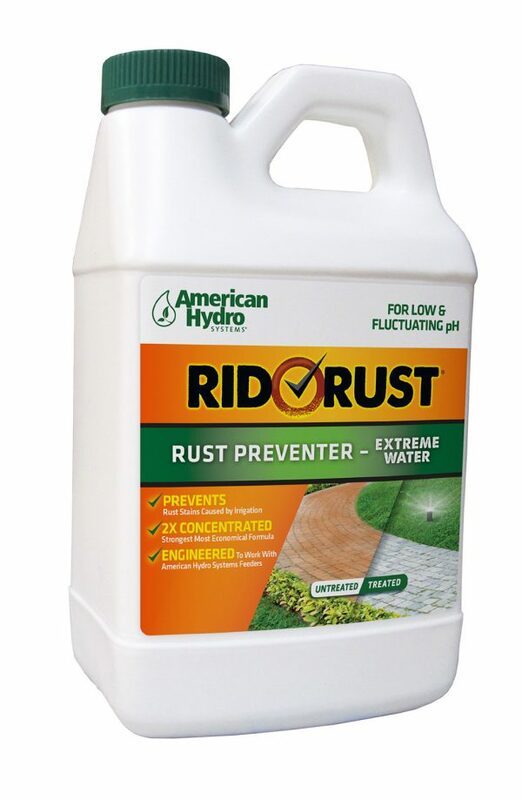 Rid O’ Rust Extreme Water Concentrate is the superior, cost-effective rust preventer for use with irrigation systems with low or fluctuating pH water. It neutralizes iron in well water to prevent ugly rust stains on your property, extends the life of your sprinkler components and prevents costly maintenance calls. 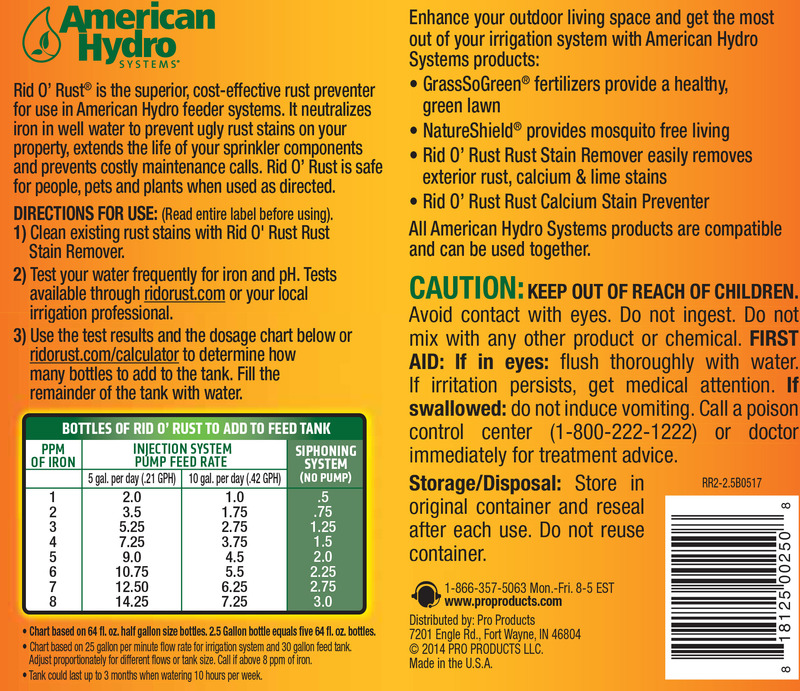 Rid O’ Rust is safe for people, pets and plants when used as directed. In order to determine the proper chemical to use, the well water must be tested for iron content, hardness and pH. In order to determine dosage for a particular application, refer to the on-line dosage calculator. Please note that Rid O’Rust Formulas will not be effective under certain circumstances. Please refer to our warranty statement. In order to determine the proper chemical to use, the well water must be tested for iron content, hardness and pH. In order to determine dosage for a particular application, refer to the online dosage calculator. Don’t know how much formula to use? Well you’re in the right place! Simply choose from the pull-down whether you need dosage for rust prevention or calcium prevention, fill in the information and we’ll do the rest. Make sure you have your test results handy because that information is important. If you haven’t had your water tested yet, request a DIY test kit or a collection kit for us to test for you here. If you get confused along the way, click on the symbol for more information about that field and if you’re still having trouble, contact us and we would be glad to help! - Injection Siphoning Please select a value for this input. - 15 GPM 25 GPM 35 GPM 45 GPM 55 GPM 65 GPM 75 GPM 85 GPM 95 GPM 100 GPM Please select a value for this input. - 10 GPD (.21 GPH @ 50%) 11 GPD (.23 GPH @ 50%) 12 GPD (.25 GPH @ 50%) 14 GPD (.29 GPH @ 50%) 16 GPD (.21 GPH @ 33% ) Model #2670 or IPU-16 Pump 17 GPD (.36 GPH @ 50%) 22 GPD (.45 GPH @ 50%) 24 GPD (.50 GPH @ 50%) 30 GPD (.62 GPH @ 50%) 40 GPD (.83 GPH @ 50%) Please select a value for this input. - 15 30 100 Please select a value for this input. - Less Than 6 6 or Over Please select a value for this input. We measure irrigation system flow in gallons per minute (gpm). What is the maximum flow rate of your irrigation system in gallons per minute? Please ask your irrigation specialist or feel free to estimate. To estimate your flow rate you will need to determine what your largest zone is. This would be the zone with the most sprinkler heads. Count up the number of heads in that zone and multiply that number by 3. This is the number you will use for this section. A siphoning system is a plastic tank with a flat lid and a clear tube that connects to your above ground well pump. The pump is usually large and has pipe running into the ground. An injection system usually consists of a plastic tank with a small injection pump drawing solution from the tank and injecting it into the irrigation piping.